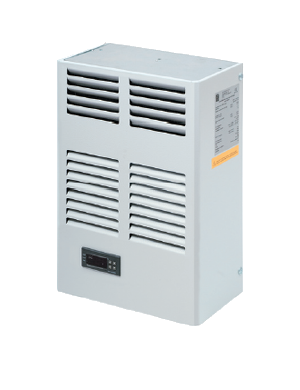 Alfa electric’s air conditioners are distinguished by the adoption on all models of rotary compressors. This type of compressors, unlike the more common alternative compressors allowed to contain the clutter in favour of a greater distance between inlet hot air from the context and delivery of fresh air into the framework. The greater distance allows the reduction of the phenomenon of by-pass, using a greater amount of fresh air produced. The rotary compressor has considerable advantages over the alternative compressor: among them being the biggest isentropic efficiency mainly due to different internal cooling which favors compression. The absence of valves in suction and dead volumes, typical of alternative systems, reduces the loss of gas pressure. The rotary compressor also reduces the weight of the unit with obvious benefits in the transport, handling and installation of the machine. The lower vibrations due to a lower inertia of the moving parts make this component quiet and durable. 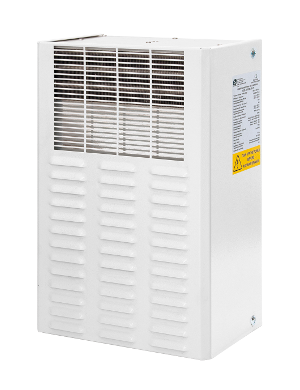 Alfa electric’s air conditioners require little maintenance on all models through the adoption of capacitor banks with a pitch between the fi ns is not less than 4 mm. The fans are treated to reduce the adhesion of dirt. Setting the standard period of the compressor to avoid the phenomenon of intermittent on/off. This phenomenon is very detrimental to the proper operation of the air conditioner. Setting the maximum value allowed for the overcoming of the maximum temperature in the cabinet, after which the thermostat emits an alarm. For all models is available the outdoor version. These units have a special cover designed to protect internal components, a condenser fan controller in according to the condensation pressure and pressure controller for the safety of compressor. On request is available a heater band to protect compressor in low ambient temperature.